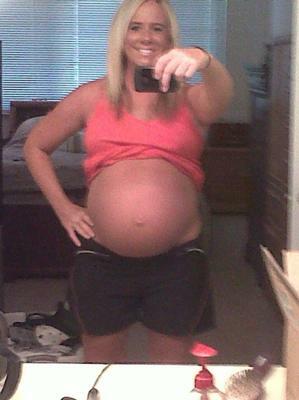 I am 7 months pregnant with Fraternal Twin boys! I still don't have any stretch marks so I hope it stays that way!! You look great! I live in Cincy, too and am pregnant with twins. I'm not due until April. Have you joined a Moms of Multiples group? I had stretch march on my single pregnance and now that am 29weeks pregnant with twins, i can even feel my belly skin cracking sometimes. I use lotion with Vitamin E but there's no change. They make me feel so uncomfortable. Hi Laura! Yes I do use cocoa butter and pure vitamin E oil but I have always had pretty moisturized skin as I have used body lotion on a daily basis for as long as I can remember. Not sure if that has anything to do with it but I am ecstatic that I don't have any yet. I am afraid to brag too much b/c I may wake up one day and have them!!! And if I do than I will deal with it but I hate to say that I REALLY hope I can avoid them. I am big into fitness and that will bring me down a little. So you are having twins also?? That's awesome! What are you having and how far along are you? Are your's fraternal or identical? Me too! Good Luck! Are you using a cream? ?